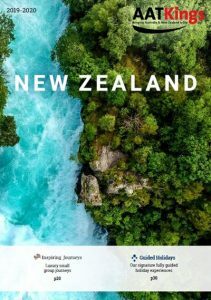 With an eye catching image of North Island’s Huka Falls as the cover shot, and over 20 exciting itineraries across two different trip styles – AAT Kings’ vibrant new 2019/2020 brochure provides agents with everything they need to bring the wonder of New Zealand to life. Check out the Best of New Zealand, the ultimate 18-day journey from Auckland to Christchurch – Cruise through game-fishing waters ‘Hole in the Rock’ in the spectacular Bay of Islands and enter game-fishing waters to the rugged Cape Brett Peninsula; Discover Waitomo & its Glowworm GrottoWaitomo & its Glowworm GrottoWaitomo and its Glowworm Grotto and wander through Mt. Ruapehu Tongariro National Park; travel past magical glaciers, mountains and rainforest en route to Milford Sound; plus top it off with a world-renowned train journey to The Land of the Long White Cloud and take in the scenery. For those with a shorter amount of time available – the Southern Spectacular is 10-day Christchurch return trip. Spend time with a Kiwi couple who share their joys and challenges of farming in the foothills of the Southern Alps. Watch master carvers as they create works of art from blocks of magnificent gemstone. These personal encounters provide a human touch that complements the grandeur of the renowned natural beauty of The Long White Cloud, with its souring peaks and waterfalls and its serene lakes and pastureland. The 2019/20 New Zealand brochure has been designed to make it easier for agents to sell with AAT Kings’ also offering a fantastic 10% Early Payment Discount for guests who book and pay in full before 27 March 2019.